I’ve updated the blog pattern pages with images and links of recently published patterns, including Revetment, Breakwater, and others on the Shawl page; Coast Oak Cowl on the Cowl page; Coast Oak Hat on the (yes, you guessed it) Hat page, and Spa Cloths 4, 5, 6 on the For the Home page. The Coast Oak Cowl and Hat, shown above, just came out yesterday, and are worked in the lovely Kismet Fiber Works Sleek DK. I have a ton of patterns (9!) nearly ready for publication; all I need to do on most is photography. You can get a sneak peek by browsing through the test threads in my Ravelry group here. Most are hats (6), most are unisex, and all are great for gift giving! On that note, the Indie GAL is still going strong — check out the group here. 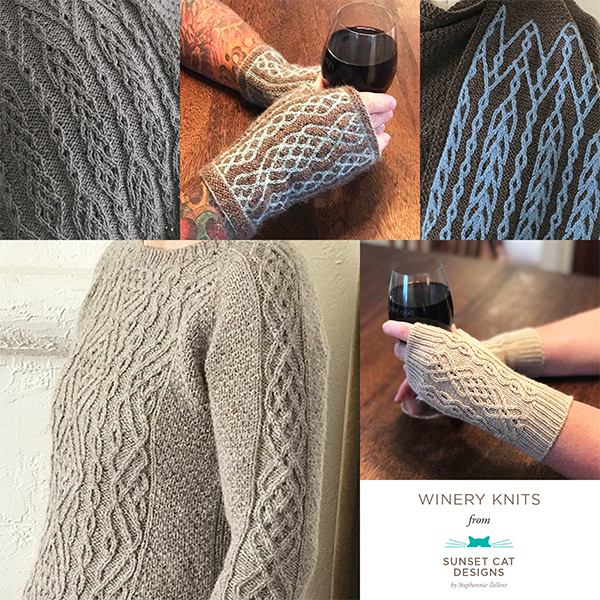 Many of my designs are now available in the Knit Companion formatting in the Create2Thrive Shop. Check out the my patterns here. What’s in the works? I’m doing a gradient shawlette with Lorna’s Laces Shepherd Sock for TNNA in early January. I’ve finished up a couple third-party designs. I’ll be doing a design for the Indie Untangled Where We Knit yarn club — you can sign up here. I’m excited to be working with Christine from Skeinny Dipping for the club.